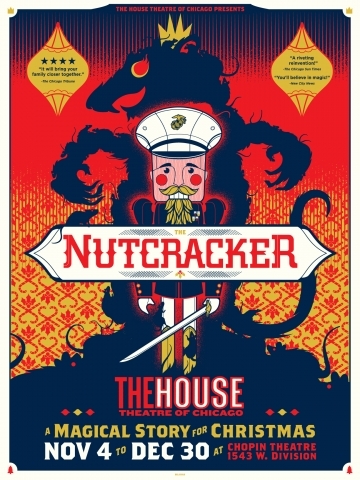 The House Nutcracker has been a long time family fav of ours here at ChiIL Mama. It's a beloved annual holiday tradition and we can't wait to catch the revamped 2016 version with some new tunes and Ariana Burks as Clara! Click here for a trip through the way back machine with our past photo features and House Nutcracker coverage. The House Theatre of Chicago once again brings holiday cheer for the whole family with its seventh annual engagement of the all-original, ballet-free The Nutcracker playing at The Chopin Theatre upstairs theatre, 1543 W. Division, November 4 – December 30. Company Members Jake Minton, Phillip Klapperich, Kevin O’Donnell and Tommy Rapley created the adaptation. Company Member Rapley reprises his role as director and choreographer of the holiday production based on E.T.A. Hoffmann’s story. Previews take place November 4 – 10 following the regular schedule, excluding matinees. The press opening is Friday, Nov. 11 at 7:30 p.m. Performances are Thursdays, Fridays and Saturdays at 7:30 p.m. and Sundays at 7 p.m. with 3 p.m. matinees Saturdays and Sundays. Preview tickets are $15 with regular run tickets $25 – $45. Student and industry same-day discounted tickets are available for $15 for all dates, based on availability. Tickets may be purchased by calling 773.769.3832 or by visiting www.thehousetheatre.com. The House’s fantastical expansion of this holiday classic centers on young Clara’s journey to celebrate Christmas in the face of grief after the death of her brother, Fritz. When Fritz returns to her as a magical nutcracker come to life, this brave little girl fights the Rat King and saves her family. The House’s modern holiday theatrical production weaves together riveting dialogue, astonishing puppetry, original song and spellbinding spectacle to tell a heartwarming, darkly moving story of magic and hope—a fun outing fit for the whole family. Freshly revamped during workshop time at the Chicago Performance Lab this past summer, repeat fans of the show have new musical additions to look forward to and new audiences will delight in the production’s creativity and heart. In addition, making her The House Theatre debut is 16-year old Ariana Burks as “Clara.” The production premiered at the Steppenwolf Theatre in 2007 under the Visiting Company Initiative and has enjoyed highly acclaimed new productions at The House from 2010 through 2015, as well as simultaneous productions in Chicago and Miami in 2012. The Nutcracker is adapted from “The Nutcracker and the Mouse,” a story by E.T.A. Hoffmann by Jake Minton, Phillip Klapperich, Kevin O’Donnell, and Tommy Rapley. The cast for The Nutcracker includes Company Member Joey Steakley (Hugo) and returning guest artists Rachel Shapiro (Phoebe) and Desmond Gray (Fritz). New cast members this year are Torrey Hanson (Drosselmeyer), Amanda de la Guardia (Martha), Nicholas Bailey (David), Ariana Burks (Clara) and Ian Maryfield (Monkey). Ariana Burks is an Emmy nominated, young actress with many film/theatre credits to date including most recently The Compass at Steppenwolf. Other theatre credits include “Little Inez” in Hairspray at Paramount, Alice in Wonderland: Alice's Rock and Roll Adventure with Chicago Children’s Theatre, “Emma” in The Black & White Ball at FWD Theatre, “Elf” in Rudolf the Red-Nosed Reindeer at the Broadway Playhouse, “Belinda/Fan” in A Christmas Carol at the Goodman and “Little Inez” in Hairspray at Drury Lane. Burks's film and television credits include Chicago Fire on NBC, Prank Stars on the Disney Channel and The Jr. Cuisine Cooking Show (Emmy Nominated) on PBS. The House was founded in 2001 by a group of friends to explore connections between community and storytelling through a unique theatrical experience. Since becoming eligible in 2004, The House has been nominated for 66 Joseph Jefferson Awards (23 wins), became the first recipient of Broadway in Chicago’s Emerging Theater Award in 2007, and was awarded a 2014 National Theatre Company Grant by the American Theatre Wing—founder of the Tony Awards. The 15th anniversary year of original work began in September 2016 with the world premiere of The Comedical Tragedy of Mister Punch. The House continues its mission to unite Chicago in the spirit of Community through amazing feats of storytelling.